Bobbi Pack (May. 13, 2014) We all remember the old saying, “The best things in life are FREE” but what can someone do for free that is actually …. well ….. uummm …. fun? After doing a little research over the four day weekend we had at Bragg I have come up with a few ideas on how to explore the cheap fun things to do with your family. platform over the next 24-36 months. 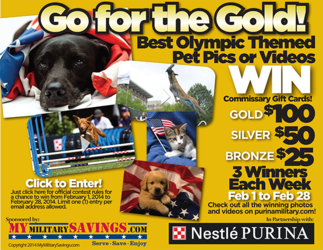 MyMilitarySavings.com is proud to support the Purina “Go For The Gold” Pet Contest. Show your Pet in an Olympic Themed Picture or Video with MyMilitarySavings.com for a chance to win the Gold, Silver, or Bronze! There will be THREE (3) Winners selected each week from February 1 – February 28, 2014. Once a Brat, Always a Brat. Jessica Power (Feb. 4, 2014) I have been to twenty-four of the fifty states, been on more road trips than I can even remember, and awaited nervously with my mom during my dad’s ten plus deployments in twenty-two years. I have friends that span the country (and further) and have moved ten times in my life. In short, I grew up an Army brat. Coronado, CA- January 29, 2014 – MyMilitarySavings.com, the #1 shopping network for military families today announced new ownership under bBIG Communications, a new digital marketing firm formed by the merger of three companies including MyMilitarySavings.com, ActionPak Marketing, and Market Tactics, Inc. I Can Use A Dryer Sheet For What? Bobbi Pack (Jan. 28, 2014) Did you know you can use your dryer sheets for much more than making your clothes smell good while they dry? You don’t have to purchase the really expensive dryer sheets, the $1.00 ones will work just fine. I found 100 dryer sheets in a box at the dollar store for $.50 per box…wow now that is thrifty. Honey and Cinnamon Can Do What!?! Bobbi Pack (Jan. 24, 2014) So, how many of you have honey and cinnamon in your kitchen? I do! And, believe it or not these two (2) everyday items have more than one use. Would Dr. King Approve of America’s Racial Progress? Bobbi Pack (Jan. 6, 2014) Have you ever wanted to know more about the amazing nurses who are on the battlefield and help save the lives of our service men and women? Well, Angels on the Battlefield: Nurses at War is a site designed to teach all of us about the sacrifices our military nurses make. I honestly never knew the occupation of military nurses date back to pre-1900’s…..that is really cool!